As I mentioned in an earlier post, I became inspired to actually try growing hops in pots by an article written by Chris Colby, editor of Brew Your Own magazine. Well, last week, James Spencer from Basic Brewing travelled out to the home of Chris Colby in Bastrop, TX to do a video interview about that article. In addition to seeing that Chris has various hops growing in about 30 large pots on his driveway, it was interesting to learn that he also has a crop of barley growing next to his house. He still has to figure out a way to harvest and then malt the grain, but he hopes to get enough in order to brew a beer from all home-grown ingredients. Sounds pretty cool. I think we have the room, but I doubt I'll be able to plant a crop of barley in the backyard. The video interview is available here. For my next batch of homebrew that I'm brewing today, I've decided to brew a "session beer". A session beer is simply a well balanced, easy-drinking beer with a clean finish that you can easily drink several of during one drinking "session" without falling off your bar stool. Session beers are typically less then 5% ABV, but are still full flavoured without overwhelming your senses with a particular characteristic. British Milds and Bitters are typically referred to as session beers. Unfortunately, over the past few years, many craft breweries have been coming out with more extreme beers that have stronger flavours and high alcohol content. Although delicious, its difficult to enjoy more then one or two of these beers in a single drinking session without getting intoxicated and overloading your taste buds. Be wary of those who claim they can "session" a Double IPA or Russian Imperial Stout. Just because you drink several of these beers in a row, a session beer this does not make. A drinking session with these people rarely turns out well. One of my favourite session beers is Pride & Joy from Three Floyds Brewing. They describe it as an American Mild. So, it is on this beer that I've decided to base my next batch of homebrew. Unfortunately, I was unable to find any "official" clone recipe, but I think I managed to come up with something that should do pretty good. A special thanks to Paul at brewnation.org who had also recently been working on a Pride & Joy recipe and I drew heavily on his for mine. Should it turn out well, Paul, I'll mail you a couple. 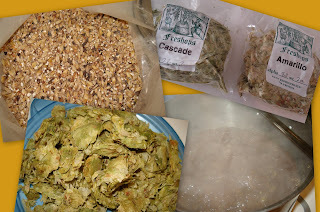 A collage of the specialty grains and hops used as well as the wort at a rolling boil on the stove. No, its not really a Dr. Seuss book. After doing much research and with encouragement from the last issue of Brew Your Own magazine, I've decided to try growing some hops in pots. I had thought it might be too hot and humid in Houston, but I've found several people that have successfully grown hops in various regions of Southern Texas, so I figured I'd give it a go. The soil around here is not very good and I'm not sure what area of the yard is suitable, so the pots will allow me to provide good soil to grow in and the ability to move them around to adjust the amount of sun and shade. It gets pretty scorching down here in the summer, so I have a feeling they'll need sun in the morning, but protected from it in the afternoon. Since this is my first attempt and I have no idea whether it will actually work, I'm starting with just two hop plants. I decided on Cascade and Nugget and ordered a hop rhizome of each from Fresh Hops. Cascade is one of the most commonly used hop in craft brewing. Its typically used for aroma, but can be used for bittering as well. Nugget is a strong bittering hop, but has a descent aroma profile. After two friends bailed on meeting up at the Ginger Man for a few pints on Sunday afternoon, I decided to enjoy the beautiful day in my own back yard and continue my "savouring instead of saving" series. And, since I was going to be just sitting around outside anyway, I decided to smoke some pork ribs and a small brisket. No, I don't have a proper smoker, but I do have a great propane grill that includes a smoker box which does a pretty damn god job of it. I prepared the ribs and brisket with my secret combination of herbs and spices and let them rest while I prepared the grill. The smoker box sits over one of the burners which heats up the wood chips inside and makes them smoke. Since the meat needs to cook slowly and indirectly, its placed over the unlit burners. As you can see in the photo, there are shallow trays filled with beer under the meat which helps to keep everything juicy and moist (and its a great way to use up any beer that you don't like or don't want). With just the burner under the smoker box turned on, the temperature inside the grill holds steady at about 250F and I keep adding new wood chips to the smoker box to keep a good layer of smoke inside. And, after about 5 ~ 6 hours, the result was tender and juicy ribs, but I was little disappointed in the brisket. While the meat was gently smoking on the grill, I enjoyed several Austin Amber and Independence Pale Ale as well as a couple of beer from my cellar. One of them was the Devil's Elbow IPA from Howe Sound Brewing. I hauled this 1 Litre swing-top bottle back with me from our trip to Whistler, BC last fall. Since it was a 1 litre bottle, I had been saving it for when I had the proper time to enjoy and savour it and Sunday afternoon was that time. It poured out with a big foamy head that laced all the way down the glass. Grapefruit flavours and aromas with a nice bitterness in the finish. It was a good quality IPA. And with dinner, I enjoyed the smoked ribs and brisket with a Spezial Rauchbier Lager from Brauerei Spezial. It was okay, but it's certainly no where near as good as any of the rauchbiers from Schlenkerla. It was a little too sweat and the smokey flavours were too subtle. After finishing a few things around house and yard, I relaxed on the patio with a couple of cold beers. First was a bottle of Local 1, a "Belgian-inspired Strong Golden Ale", from Brooklyn Brewing. Brooklyn is relatively new to the Texas market, but not to the craft brewing scene. It was founded in 1988 and the world renowned brewer, author and all-around snappy dresser, Garrett Oliver, is the Brewmaster. It was a refreshing beverage after digging around in the yard. After the Local 1 was gone, I dug out the 12th Release Harvest Wet Hop Ale from Sierra Nevada that I had retrieved from my beer cellar and stuck in the fridge that morning. This is a beer that is brewed with hops that were picked and shipped wet or un-dried that same day. Sierra Nevada is one of the oldest craft breweries, founded in 1980 by Ken Grossman in Chico, CA. As you can see, it poured with a big foamy head in the mug. Juicy was a word that came to mind after the first drink. Citrusy and piney were two more. A very smooth and drinkable beer. Today is the day that everyone makes believe they're Irish as an excuse to drink green beer and get drunk (did you really need an excuse?). 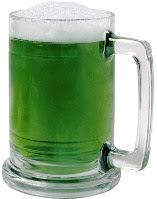 However, the "green beer" served at most bars is usually just some crappy macro lager with green food colouring dumped in. I suggest that if you choose to partake in these festivities, you just stick with some Irish brewed beer such as Guinness, Murphy's, Beamish, etc. and avoid the green stuff. I'm not Irish nor do I feel the need to make up an excuse to drink, so I'll probably just have whatever I'm in the mood for. Slàinte! I threw open the double doors to my beer cellar this afternoon, surveyed my growing inventory and came to the realization that... I have a lot of beer. Although, since I live in Houston, its not really a cellar, its actually just a large hallway closet. Anyway, I recently reorganized and catalogued all the beer so now I actually know what I've got. Some beers were purchased with the idea of cellaring, but some have been cellared by accident. Those are the beers that I forgot I had and those I felt needed to wait for a more special reason then a typical Tuesday to open. However, today, I decided to stop saving and start savouring. So, I reached far into the back, dug around and pulled out... Édition 2005, a Belgium Strong Dark Ale brewed by Unibroue. The production date of 11-23-2004 printed on the bottle indicates an age of just under four years and four months. Since its 10% ABV, I figured this one could stand some cellar time, and I was not wrong. It poured a deep, dark ruby colour with a nice head the dissipated quickly. Flavour is strong and fruity with a slightly sour and acidic finish. The higher alcohol is hidden well. I'm not going to waste my enjoyment by writing a full review. I intend to savour this slowly as the rain pours down and my dog lounges on my lap. Cheers. Okay, I'm from Canada and even I think this is just wrong. The New Brunswick government has started producing and selling a low-cost beer. 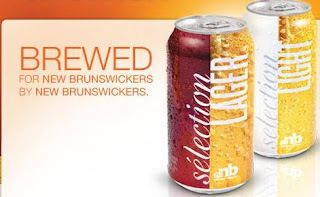 Selection Lager and Selection Light are "...premium-quality, low-cost brands, which are brewed for New Brunswickers by New Brunswickers." Apparently, beer drinkers are driving to neighboring provinces and states to purchase beer for lower costs and the New Brunswick Liquor Corp is losing $12 Million a year. These two new low-cost lagers are supposed to help keep some of that money in the province by providing a cheap alternative. The beer is actually contract brewed by Moosehead Breweries. Obviously Moosehead is pretty happy with the arrangement, but the other breweries and brewpubs in the province are understandably, less then thrilled to learn their new competition is their own government! More information about the new lagers is available at the their website. The size of the crowd attending the monthly Tour & Tasting at Independence Brewing has been growing each month since it started. At the most recent tour day, a line to get in started forming at 12:30 and there was easily over 500 people in attendance. Although everyone was enjoying themselves, the lines for the beer samples at both serving stations extended across the entire parking lot, making for a lengthy wait for a beer and a very busy day for the volunteers. In order to ensure a more leisurely and enjoyable time for everyone, there will be a few simples changes to future tour days. Entrance to the brewery will not be allowed before 1:00pm. Tickets for the beer samples will only be handed out until 2:00pm, but the brewery will remain open until 3:00pm for you to relax, play games and enjoy your beer. 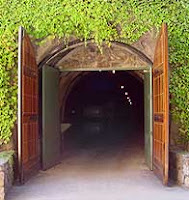 Entrance to the Tour and Tasting will remain FREE! The next Tour and Tasting day is March 7th. Celebrate Texas Independence with an Independence Pale Ale! On this day in 1836, representatives of the Texas settlements met in the small town of Washington on the banks of the Brazos river to declare their independence from Mexico and sign the Texas Declaration of Independence. This flag (created by Captain William Scott in 1835 and used by those Texans who favoured independence from Mexico) was actually the inspiration for the name and logo of Independence Brewing and a replica of it proudly hangs in the brewery. So, what better way to celebrate Texas declaring its independence then with a beer from Independence Brewing! Available at many stores, bars and restaurants in Austin and San Antonio and at most Spec's locations in Houston.